Handcrafted fine jewelry by Marvin Lansden of Darmar Enterprises. To Order: contact us for details. Pendant - Enhancer. Kunzite and tanzanite. 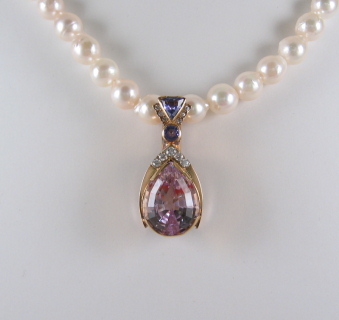 The centerpiece of this pearl enhancer/pendant is a beautiful natural color, pear-shaped pink kunzite with purple undertones. The kunzite is crowned with sparkling diamonds and accented with two tanzanites, blue with purple undertones. The enhancer bail has a hinged clasp and hinged safety clasp. Bail opening is 6mm x 3.5mm and fits snuggly on a knotted pearl strand. Measurements: Pendant - 32.7mm x 14.8mm x 12.5mm deep. Kunzite - 13.66 carats, 17mm x 13mm. Tanzanites - trillion - 5.5mm, 0.51 carats; round - 4.2mm, 0.35 carats. Diamonds - 0.22 carats total weight. Displayed on a strand of baroque pearls, not included. More pictures. 1 piece. kunpn. $3127.00. Necklace. Tanzanite Pear Shape. The center piece of this necklace is a beautiful blue tanzanite pear shape surrounded by diamonds. 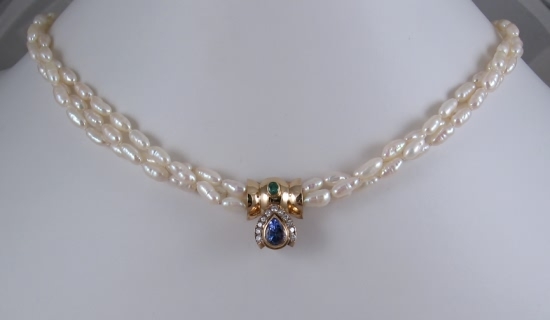 A fine emerald enhances the flat-backed flared bail/connector for the three strands of beautiful slim pearls. A double spring clasp repeats the shape of the connector and has a bezel set sapphire color matched to the tanzanite. The entire piece is hand-wrought and strung by Marvin Lansden. More pictures. 1 piece. tnznk01. $3480.00. Pendant. 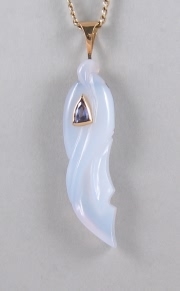 Carved Blue Chalcedony and Tanzanite Pendant. Fine translucent blue chalcedony carved in a graceful curved ribbon. Tanzanite triangle is bezel set through the chalcedony. Entire piece is handcrafted by carver/designer Marvin Lansden. All gold parts are 14 karat. Bail will accommodate up to 4mm chain. Overall measurements: 2.54 inches x .55 inches. Tanzanite triangle: approximately 7.75mm x 6.7mm. More pictures. 1 piece. blchalpen. $1242.00. Necklace. Mason County Lone Star in Onyx. 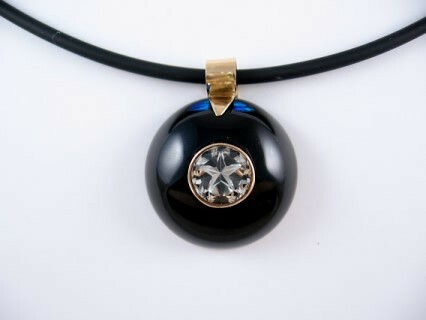 White Mason County Lone Star Cut topaz set in 14kt yellow gold bezel in the center of a large, high dome black onyx and accented with opal inlay. Striking necklace is designed and handcrafted by Marvin Lansden, including gem faceting, onyx drilling and finishing, opal inlay and gold fabrication. Neckpiece is 16" black rubber cord with 14kt gold lobster claw clasp. Topaz - 10mm. Black onyx - 30mm diameter, high dome cabochon. More pictures. 1 piece. mslsonyxpen. $1670.00*. Order this style made for you by contacting us for current price and availability. Each handcrafted piece will differ slightly in detail from the one pictured above. *Price is subject to change because of fluctuations in materials prices. Ring. Tanzanite. Rich, medium color tanzanite cushion cut stone, accented with four diamonds, and mounted in a semi-bezel setting. The feminine by-pass ring is carved to the shape of the mounting for a fluid look and secure fit. 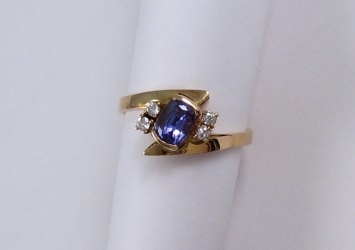 Tanzanite - 0.86 carats, diamonds - 0.10 carat tw., 14kt yellow gold. Size 6 - 6-1/4. 1 piece. tanzrg. $1,198.00. Web Services Click to bookmark this page!